This is a lovely, opalescent amethyst, elestial and with a teeny bit of golden healer staining on his well-keyed and terminated base. 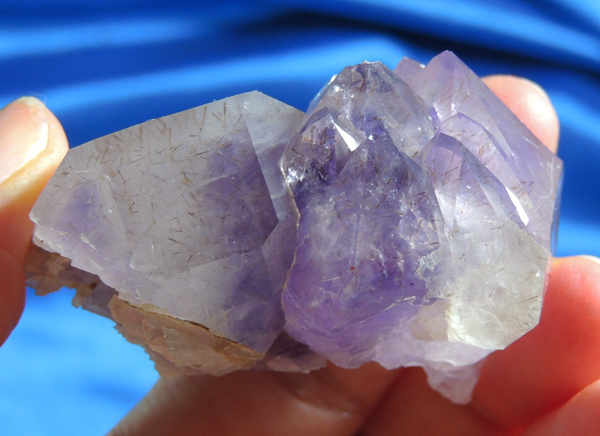 There is a gorgeous and grapey amethyst at his core and all of his crystals have nice phantoms. Faces and sides exhibit a variety of neat glyphs and with a loupe, you will see the little inclusions of cacoxinite that flash gold as you turn him in the light! He is from a most uncommon African location (Namibia) and weighs 2.3 oz and is 2.1” by 1.4” by 1.2”. This is a Shaman Spirit, particularly used for expressing the inner power the apparently hidden epitomizes. He calls upon the World of Magic and brings hidden (aka ‘occult’) vision to his Keeper. I get the sense that his special gift is that of herbs and herbal remedies. He allows his Keeper to tap into the vibrations of the plant kingdom, allowing each to present their unique gift to healing. Use him with care, taking precautions not to abuse. He is dedicated to healing and truly wants no other purpose.